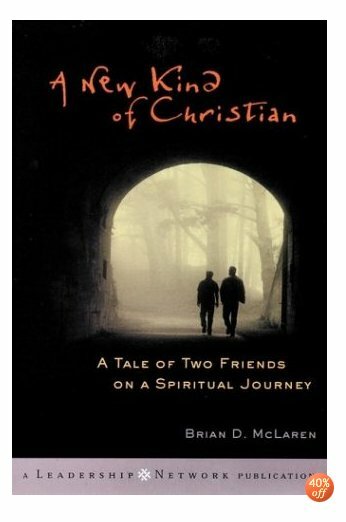 I just recently finished reading A New Kind Of Christian in my Contemporary Christian thought class. We’ve been discussing postmodernity and the “emerging church” and it has really been good for me to hear people really dealing with the subject. Our class is primarily discussion based so we end up throwing ideas and questions out for each other through the majority of class. First beginning this discussion I was frustrated by all the “misunderstandings” people had about the emerging church. I thought they were missing the whole point of the whole thing (and I may have been right). I recently caught myself in this frustration, realizing that I was returning to the way I once thought about Christianity. I used to think that I had the best possible understanding of who God is and what He’s up to and then I began reading and understanding new things about my faith. I went through a great process (in which I am still continuing) of laying down certain ideas that I thought were true and I now realize are not, reaffirming things which I still believe are true, and taking up new ideas. This process brought me to a great appreciation for and an immersion into, at least theologically, the “Emerging Church.” This is not to say I’ve abandoned “modernity” all together and it really isn’t even that I have converted, so to speak, into the emerging church. I have critiques on both sides but the emerging shoe seems to fit a little better on me. To get to where I am now I had to question things, I had to be skeptical about certain theologies and practices which were being suggested to me. If it were not for some friends (I have to mention Robin Dugall here) who gave me the avenue to question and allowed me to do so openly the process might have been unbearable. Everyone has to be given that avenue, the opportunity to be honest with themselves and question things. I found that in our class I was not doing so. I was frustrated and impatient with their questions. I was annoyed that they didn’t understand. I was going back to where I was, thinking that I had a handle on things. I failed to realize that these questions are necessary. It’s necessary to question if the emerging church has married itself to postmodernism and relativism. It’s necessary to question if the emerging church is pluralist, inclusivist, or even universalistic. And it’s even more important to ask the big questions; question about God’s nature, heaven, hell, the world, Jesus. But how do we respond? Do we help people ask these questions or would we rather they hurry themselves in their thinking to arrive at our position? The dangerous thing about knowing is that it’s hard not to expect everyone else to know. Was just at APU to see my daughter in the production of "Joseph... etc." If you get a chance, go see it! They did a GREAT job!!! I can hardly wait for the REAL theater to be built! Wes, what exactly IS "our position?" Has the emergent doctrine been codified somewhere and I missed it? I think questions are key to this emergent faith. Be patient and understanding with your classmates...and know this--you DON'T have all the answers! that was actually part of my point. I don't have all the answers and the Emerging church doesn't have their position spelled out. There are certain understanding that the emrging church has though, not spelled out but generally distinct. For example; Generally the emerging church believs in a reconstruction of doctrines. It isn't spelled out anywhere but most emergents share this stance. I think they just finished it and I never got a chance to see it. I really felt bad that I missed it. I'm glad you liked it. Do you know when the "REAL" theater is getting oput in?